Many type of countertop material is available in the market which makes it really difficult to choose the right type of counter top material for your kitchen. Kitchen Countertops make a significant contribution to the kitchen so it becomes very important to choose the right kind of material for your kitchen countertops. In this article you will read about the Kitchen counter-tops materials pros and cons which surely help you to choose right countertop material for your kitchen. We all know the importance of the countertops in kitchen as all the activities that take place in kitchen are centered on the countertop. The kitchen countertops make a significant contribution to the kitchen; this makes it essential to choose the right material for kitchen countertop judiciously. Many type of kitchen countertop material is available in the market let us look at the various materials which can be used for kitchen countertops. Pros: Granite countertops hold up to heat and come in a range of almost 3000 colors. It is very easy to clean them just warm water and a mild detergent will be sufficient to clean these types of counter-tops. These are hygienic as bacterial contamination is not a problem with granite. 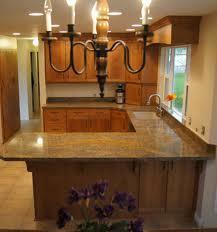 Last but not the least Granite countertops add value to your home and don't d­epreciate in value. Cons: Granite is expensive and the labor-intensive installation can run three times more than the cost of the material. As granite is heavy so you need additional structural support, especially in spans and cantilevers. You cannot get rid of them very easily as Granite countertops last forever. Granite can be scratched and leaves watermarks if not cleaned up immediately. 2. Marble countertops for kitchen: Marble countertops look very beautiful and elegant. They can change the whole look of your kitchen. To get the luxurious look, use it on an island or inset at a baking center. You can also use cultured marble countertops that are more within the affordable range and if seamless slab or cultured marble are unaffordable, you can use marble tiles to get the richens of marble at affordable cost. Please read the Marble countertops pros and cons before installing them in your kitchen. Pros: Marble slabs or countertops looks beautiful and traditionally used for pastry tables. It's an ideal work surface. Though it is soft but it is hard enough to withstand high traffic. Cons: Marble countertops have many disadvantages as it get stained very easily so you have to clean the spills immediately to prevent staining. Marble is not a very good heat resistant as other countertop materials so you cannot put hot items on the marble countertop directly. T is not easy to repair the marble countertops unless the countertop is marble tile. Also, marble cannot withstand acids. 3. Solid surface countertop materials: Solid surface countertops are good choice for kitchen countertops some popular brands of solid surface countertop materials are Corian, Silestone, Avonite, Shirestone, Gibralter, Earthstone, Staron, Mystera and some others. Solid Surface countertops are made of durable, man-made acrylic and can be custom-made to your specifications. Solid surface countertop countertops pros and cons are given below please have a look. 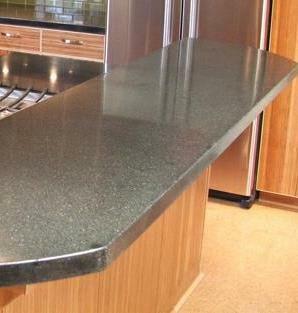 Pros: These types of counter tops come in many colors so you can choose according to the color scheme of your kitchen. Solid surface countertops are durable, easy to clean and are water resistant. It is good for custom applications. Cons: Solid surface countertop cannot resist to hot pans. It can be scorched or stained very easily. 4. Ceramic tile counter tops are found in many colors, styles and patterns which can be easily installed. Ceramic tile counter tops comes in endless range of colors, textures and designs so goes well with any kind of kitchen color scheme. Ceramic tile counter tops pros and cons are mentioned below. Pros: You can put the hot pans directly on these types of countertops. These tiles are resistant to stains, burns and scratches. These are easy to install and can be clean very easily. Cons: Tile countertops can become the house of bacteria if not sealed properly. 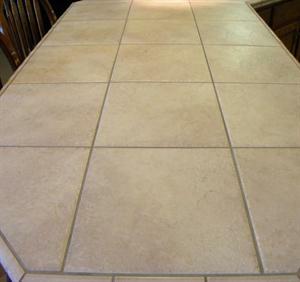 Tiles can easily chip or crack and you can get uneven counter surface sometimes. 5. Wood or Butcher Block counter tops for kitchen: These type of counter tops are made from hardwoods like maple, red oak and teak. They offer a warm look and available in a wide range of colors and finishes. Please read the Wood or Butcher Block counter tops pros and cons. Pros: Wooden countertops are easy to clean and look very beautiful. They can be sanded and refinished very easily. Cons: Very low heat resistant and hot pans can burn surfaces very easily. You cannot use them for chopping purposes especially with raw meat or preparation of food susceptible to salmonella and other bacteria. Regular contact with water can damage it badly. 6. Laminate kitchen countertops are available in hundreds of colors and patterns and are reasonable in choice. They're made of plastic-coated synthetics and very easy to clean. You can install laminate countertops very easily as they are lightweight. Laminate kitchen countertops pros and cons are mentioned below please have a look. Pros: Laminate kitchen countertops are Water-resistant and very easy to maintain, just clean them with sponge and nonabrasive cleanser. 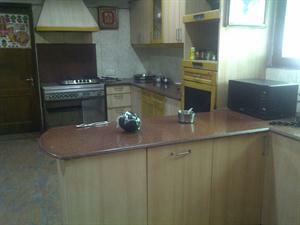 You can buy them relatively very low cost than the other countertop materials. 7. Stainless Steel kitchen counters are recommended for the commercial kitchens not for the homes. They are heat resistant and durable. To get a contemporary and industrial look for your kitchen these countertops are excellent choice. Pros: Waterproof, scratch proof, easy to clean and give your kitchen Sleek modern appearance. Cons: They can be expensive and make lots of noise. Installation cost is very high and can get dent very easily. 8. Concrete Counters for kitchen are the best choice if you have countertops in unusual shapes. Concrete offers endless design options since they're fabricated to your specifications. But it also have some advantages and disadvantages so please read the Concrete countertops pros and cons given below to get more familiar with this countertop material. Pros: Highly heat and scratch resistant. 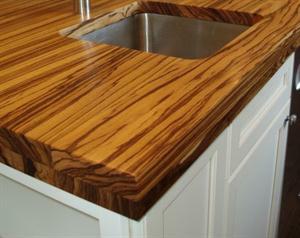 It looks exotic and gives a wonderful look to your kitchen counters. It may be shaped and colored any number of ways. Cons: Fabrication cost is very high; cracking is possible and Needs to be resealed periodically. Concrete slabs are prone to damage from hot pots. 9. Soapstone Counters for kitchen are perfect for a contemporary kitchen. Soapstone is generally dark gray in color and has a smooth feel so it gives an elegant look to your kitchen. It has timeless qualities and classic appeal. 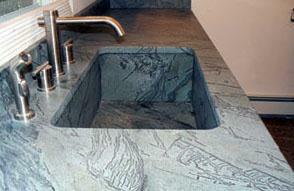 But it is good to know the Soapstone Counters pros and cons before installing them in your kitchen. Pros: Give smooth feel, deep color so does not look dirty very quickly. Cons: It requires lot of maintenance and may crack and darken over time. 10. Engineering stone Countertops for kitchenare available in a larger range of colors than granite and has a nonporous surface that resists scratches. 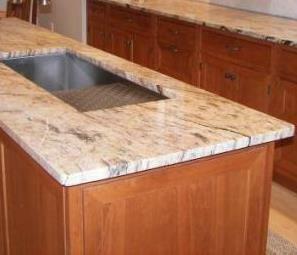 Engineered stone countertops can be a good solution for your counter needs. Engineered stone is composed of 93% quartz particles. So choose the countertop material according to your budget and requirement after reviewing all advantages and disadvantages of every material.